But what does this decline mean for the health and vitality of our public lands? Like your lawn, which needs trimming and mowing, rangelands need attention or they die. Harvesting the annually renewing forage on our public lands maintains the health of these ecosystems by reducing fuel loads that could otherwise lead to catastrophic wildfires. Cattle, sheep and other grazing animals are constantly on the clock helping prevent the devastating effects of out-of-control wildfires. But the disappearance of ranchers means much more than the loss of a cultural icon. The erosion of grazing across the American West has a profound and lasting impact on taxpayers, local economies, and perhaps most importantly, the environment. In a new study released by the Coalition for Self-Government in the West, we found that from 1949 to 2014, the average number of grazing district Authorized Unit Months (AUMs) — a measurement that takes into account both the number of livestock and the amount of time they spend on public lands — approved by the BLM in the 11 contiguous Western states plunged from 14,572,272 to 7,160,432. Some states, such as Utah, have seen a drop-off of more than 70 percent. During the same 65-year period, the number of operators and permittees/leases allowed to graze plummeted from 21,081 to 10,187. Ranchers are also a vital piece of the rangeland puzzle. Take volunteer firefighting, for example. Rancher-run rangeland fire protection associations mobilize as first responders — often extinguishing blazes long before federal fire crews arrive. In Idaho alone, 146 rangeland protection firefighters fought 56 wildfires in 2015. It would be almost impossible to quantify how many watersheds, how much wildlife, and how many acres of vital habitat these volunteers have saved over the years. This environmental stewardship extends well beyond firefighting as ranchers regularly partner with environmental agencies and universities to monitor land, water and wildlife; report suspicious and illegal activity to local law enforcement; plant fire-resistant species; and improve water sources. As the number of ranchers and animals grazing on our public lands continues to decline, so will these irreplaceable benefits. Unresponsive bureaucratic agencies and damag­ing federal policies have been pushing livestock off the range for more than half a century. From the federal government’s inability to protect our public lands from the devastat­ing effects of wildfires to its bad habit of not increasing the number of animals grazing fol­lowing droughts, it is clear that serious reform is needed in how our rangelands are managed. There is no denying that market forces, such as the decline of America’s sheep industry, have played a role in the decrease of grazing on fed­eral lands. However, instead of mitigating these effects, unresponsive federal policies are making life more difficult for rural Americans — add­ing insult to injury. It’s time to undo decades’ worth of harmful management practices and bring grazing back to our public lands. In response to this decline in grazing, the Utah State Legislature is considering a resolution urging the federal government to implement policies supportive of grazing on public lands. HCR 7 highlights the positive impacts that grazing has on the state of Utah and the role it needs to play in the future of our state. This is good policy for all who use our public lands. Grazing reduces fuel loads, which helps prevent catastrophic wildfires. 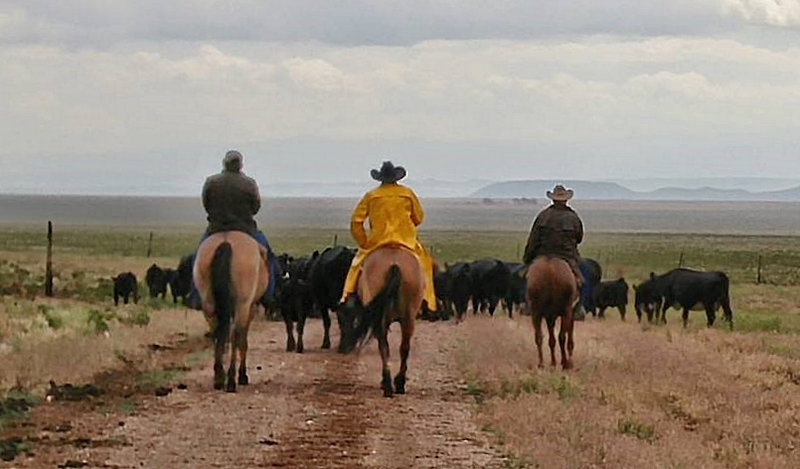 Recreationists hike cattle trails and utilize roads established by ranchers. Stock ponds are a year-round supply of water for wildlife. The Coalition for Self-Government in the West urges our Legislature, Congress, federal land management agencies and the president to take actions supportive of this resolution and, once again, reinstate grazing as an integral part of public lands management. I do not think that people realize how much the grazing permittees do. They just want to believe that we are getting something for a reduced cost and feel that we believe we deserve more for nothing. That is not true. We work very hard to maintain fences, trails, and water sources, i.e, springs, ponds, tanks, etc. In most cases, the reason there is a trail at all is because a permittee maintains it. Water sources are used by wildlife and recreationists as well as the livestock. On top of paying to have our livestock on the grazing permits, we have to do alot of work and put out our own money to do it. So the AMU price might seem cheap but the maintenance and other costs are not.